By the time I'd organized my sewing closets, I discovered that I own a lot of print fabric. 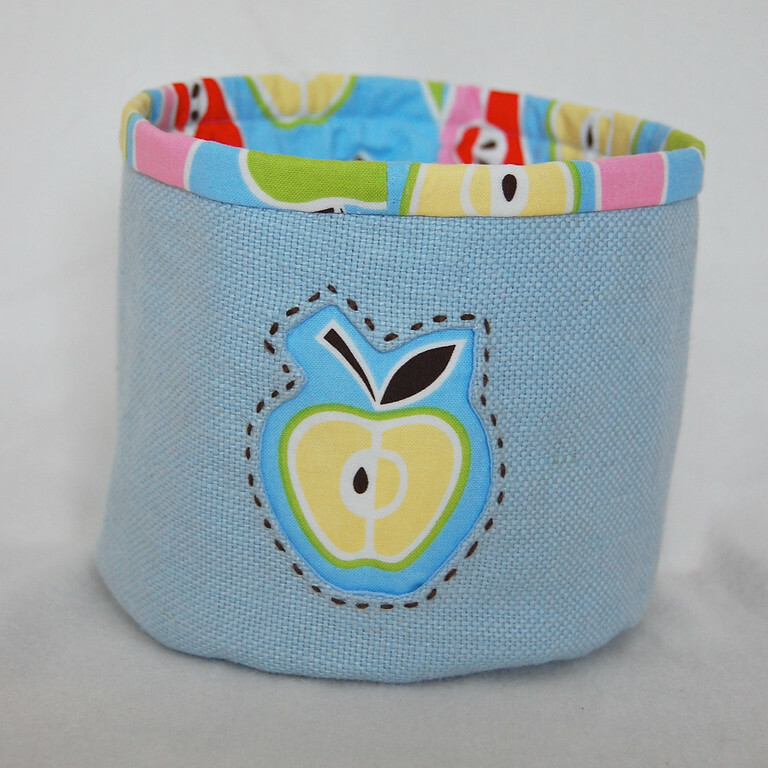 This was strange - because I've always preferred working with solids, I thought most of my stash would be solids. Instead, about half of it is patterned. Half!!! if I count polka dots, gingham and stripes as "print", then why yes, I do use a lot of print fabrics. I hardly ever coordinate different print (motif type) fabrics together in the same thing I'm sewing. One print fabric is already visually overwhelming for me, and to have two or three, especially when they aren't pre-coordinated by qualified fabric designers, would just about ruin the project. there's funky prints and then there's funky* prints. I own both kinds. Eek. * as in, "Eeeeeeew, that is some funky-smelling cheese!" Now, I'm probably in the minority in the crafting world where designer prints sell products and designers themselves are like royalty. 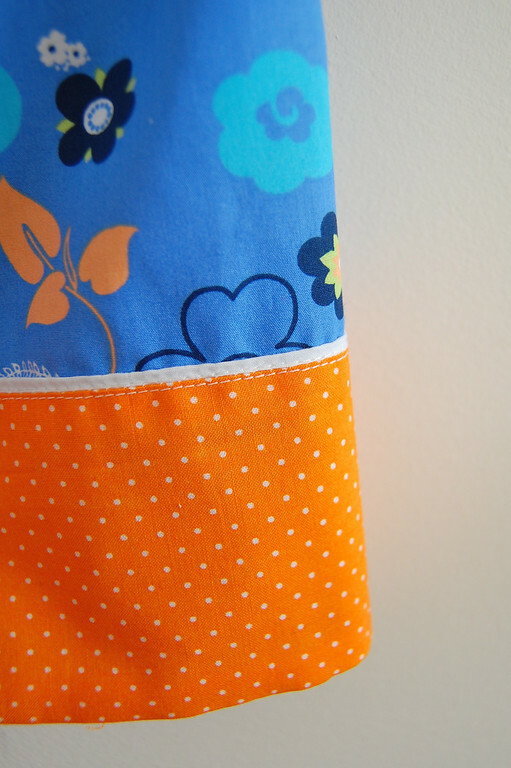 Most of you already happily use lots of print fabric, and have absolutely no problems buying more. But for the handful of folks out there like me, here are one dozen ways in which I use print fabric when I don't want it to be the main event. An easy one for those of you who quilt - this is why quilting cotton exists in the first place. 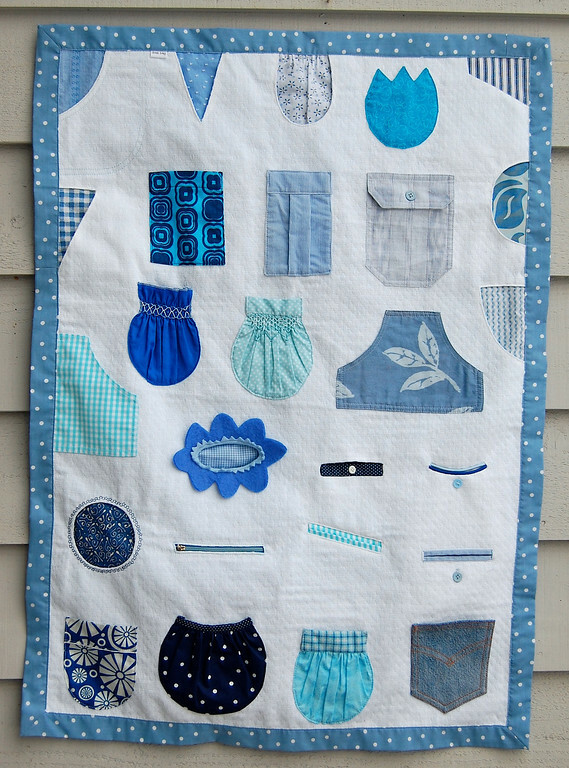 I don't quilt, but occasionally I need to sew a um... wall-hanging made of small elements. In such cases, I'd happily use print fabrics, but on a background that's solid. 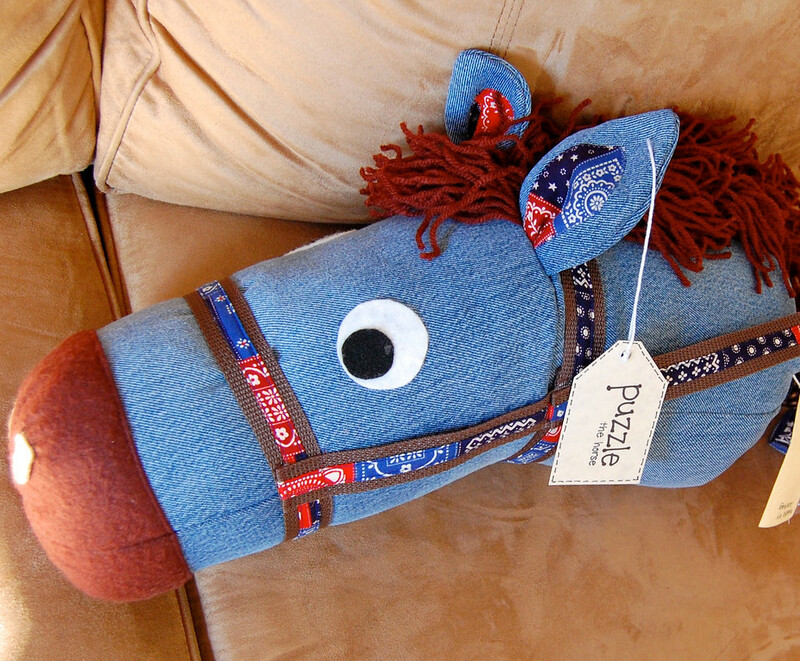 Erm... and since that's the sum total of the "quilting" I've done, let's move on, shall we? 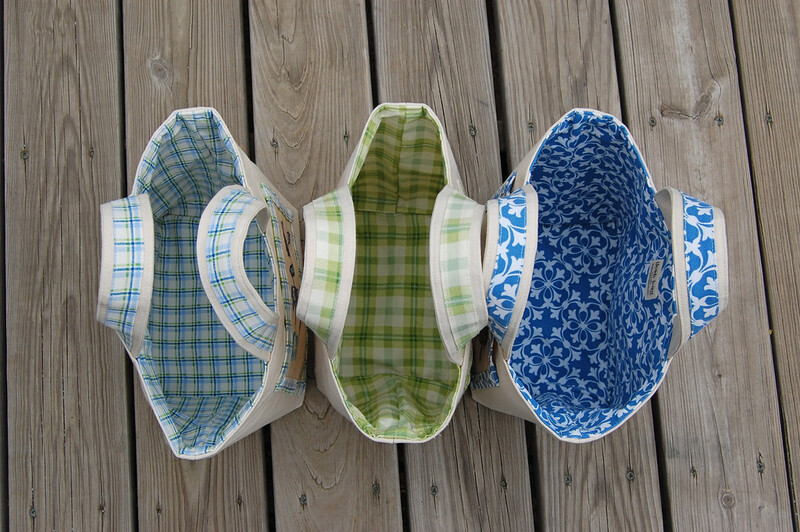 This is probably the main way I use print fabric in large amounts, especially in bags and other receptacles. 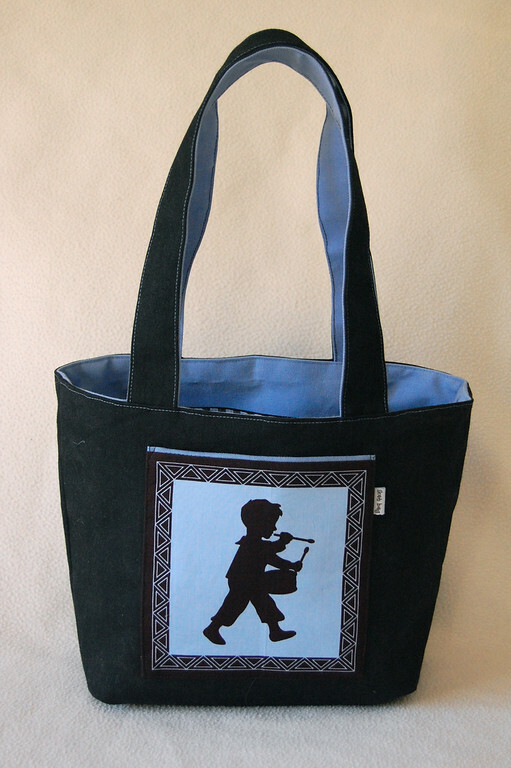 The print fabric is almost invisible to passers-by because it is hidden, but the owner gets to see it a little bit when actually using the bag. Feels funky without actually looking it. Score. I also do sneak this into garments that I want to leave externally plain/solid. 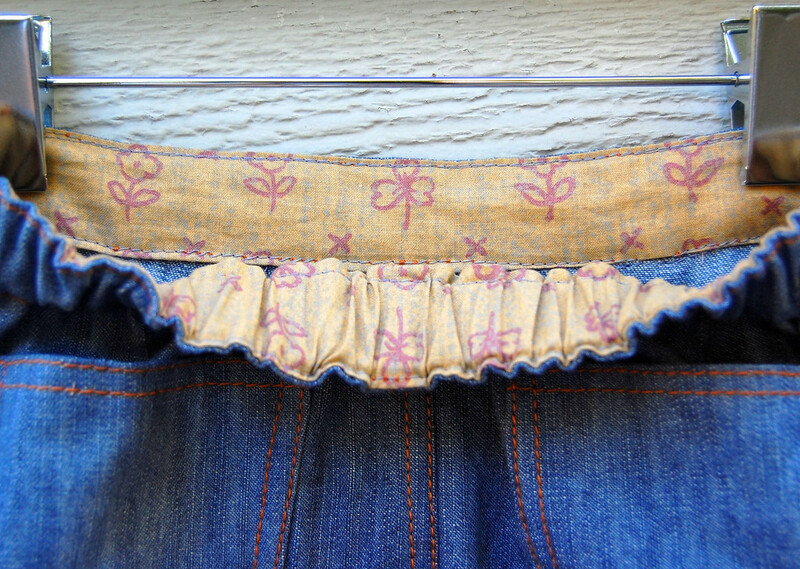 Here is the waistband of a denim skirt, lined with print on the inside. 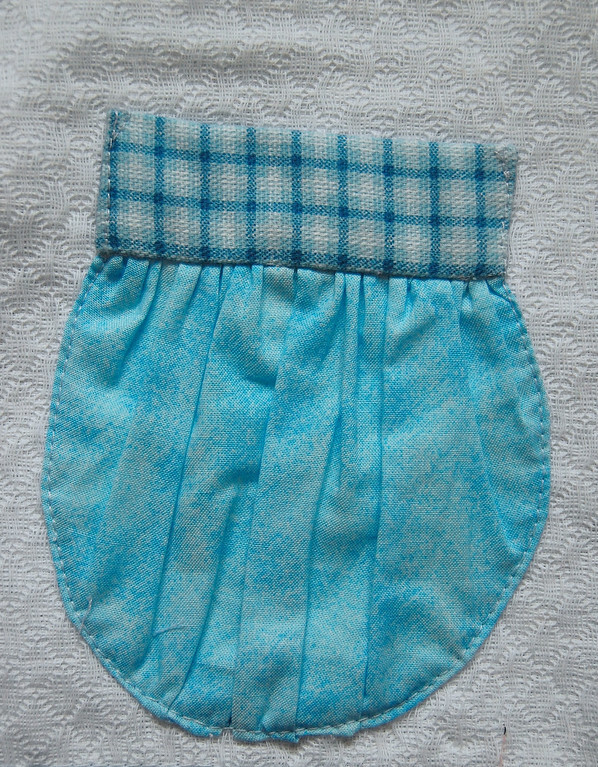 I've also used them for other facings - on bodices and pockets - when the external fabric is solid. 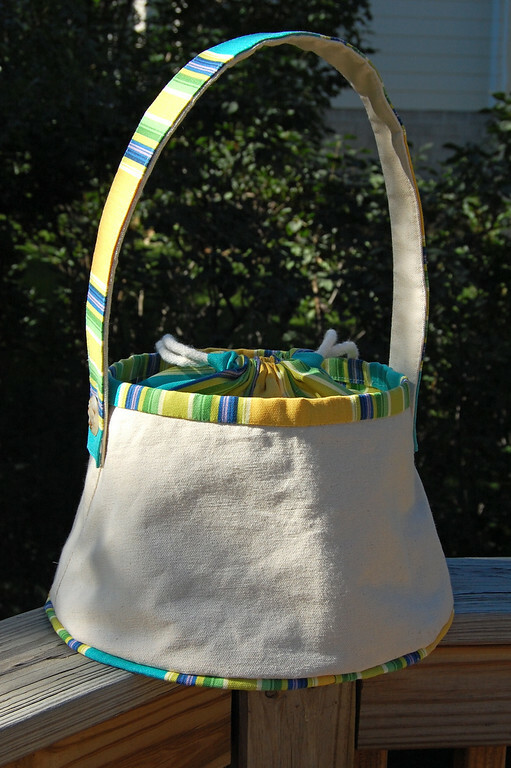 Piping is a lot of fun to use because you can make your own to coordinate or contrast with the main fabric. And because it is stiff, it holds the shape of whatever you pipe around. 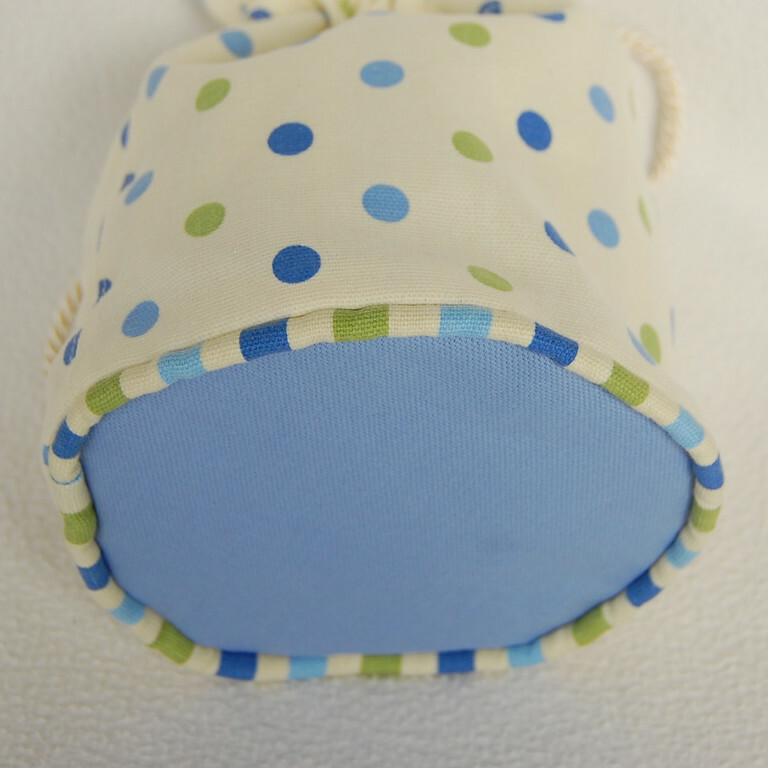 and bases of pouches and bags. and faced hems. 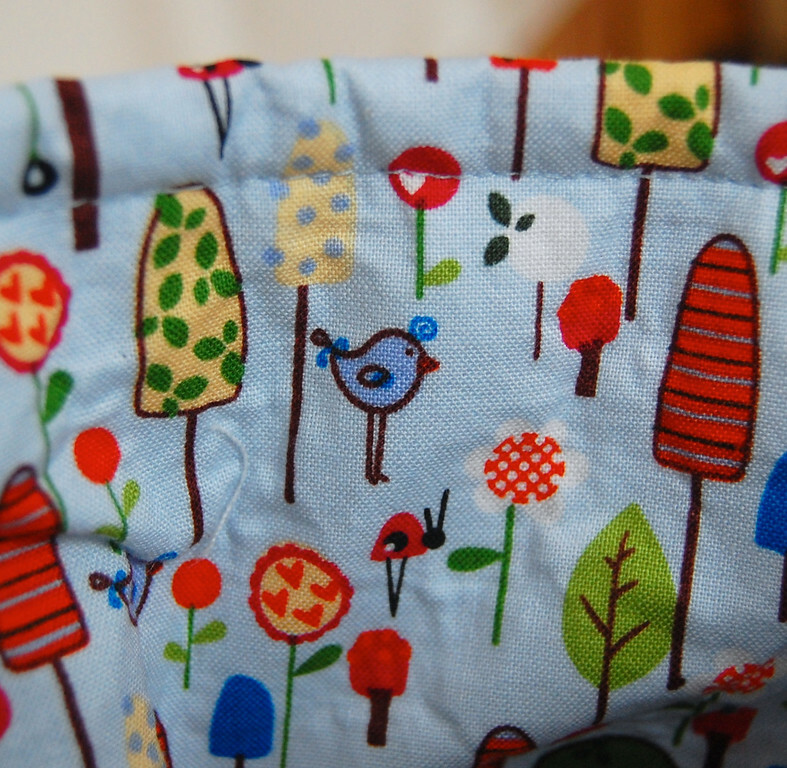 Apologies- I know this one is the reverse of what I'm trying to say because the edging is solid white and the hem and main body are both print. Imagine this the other way around, OK? 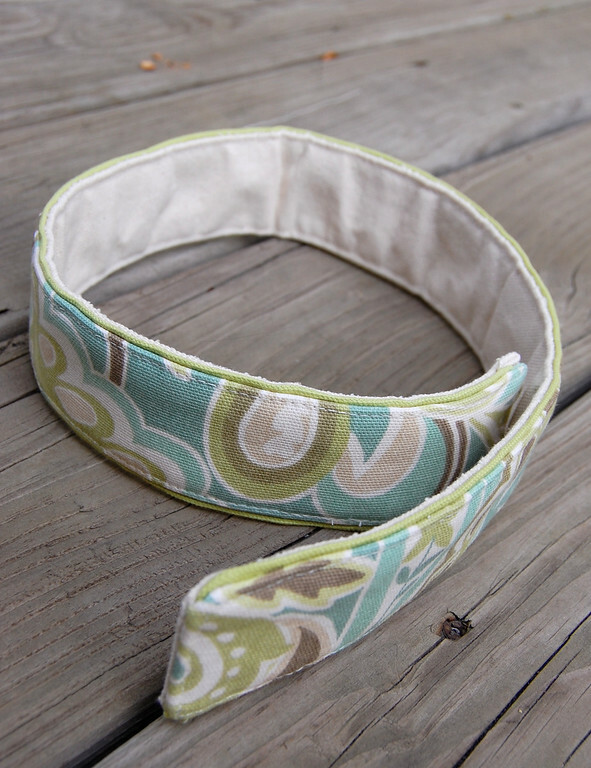 If you are binding a curved edge, cut your binding strips on the bias of the fabric because they hug curves better. But they use a bigger area of fabric this way. 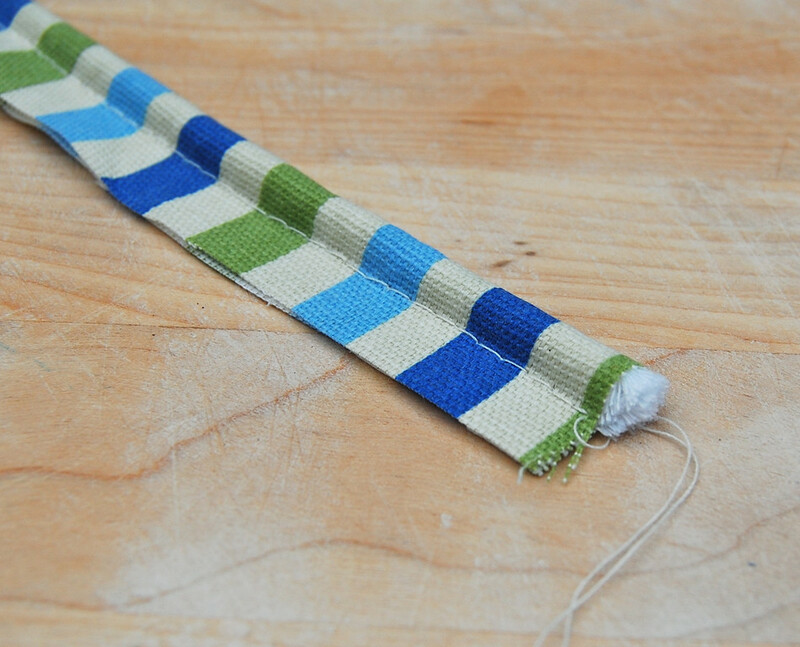 If you are binding a straight edge, you can cut the strips along the regular cross-grain of the fabric and save fabric. If the rest of the project is primarily solid, I have also made the entire strap out of print fabric, with solid piping along the edges. 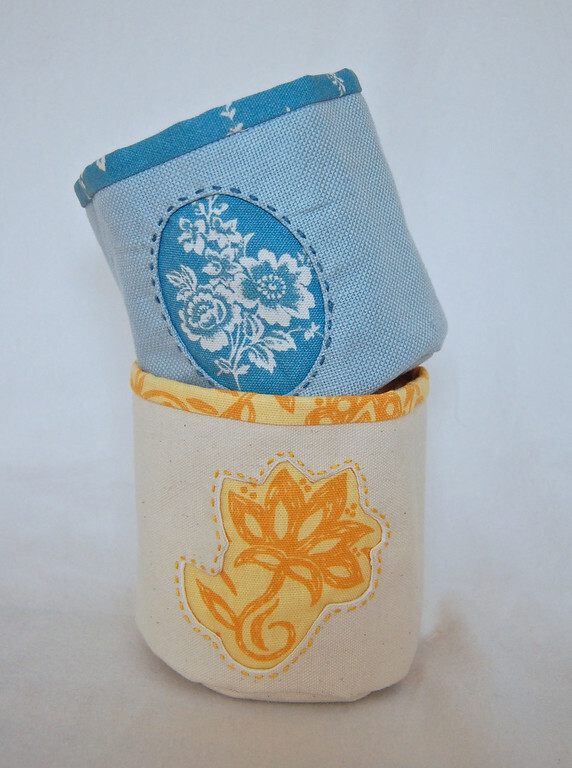 are another way to use print fabric in largish amounts. 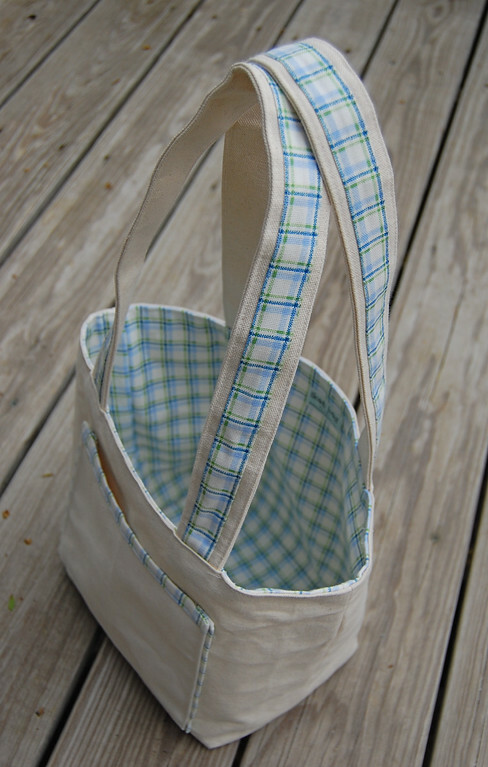 This is a bag that features a large panel print - it became a natural pocket. 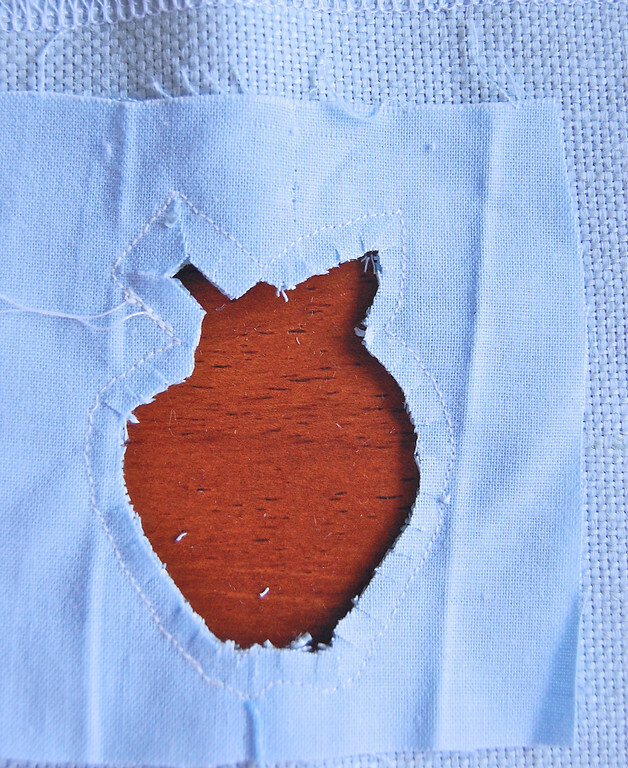 Sometimes I just cut out a more geometric outline around the motif and top-stitch the whole thing on. 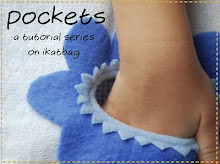 Applique is also very useful for patching holes in garments, so the next time you have rips in the knees of your kids' jeans, and a large stash of print fabric you can't stand the sight of, you'll know what to do. to make a coordinated final product. in which case you could enjoy it without having to sew it! Yay. What- you say that's cheating? 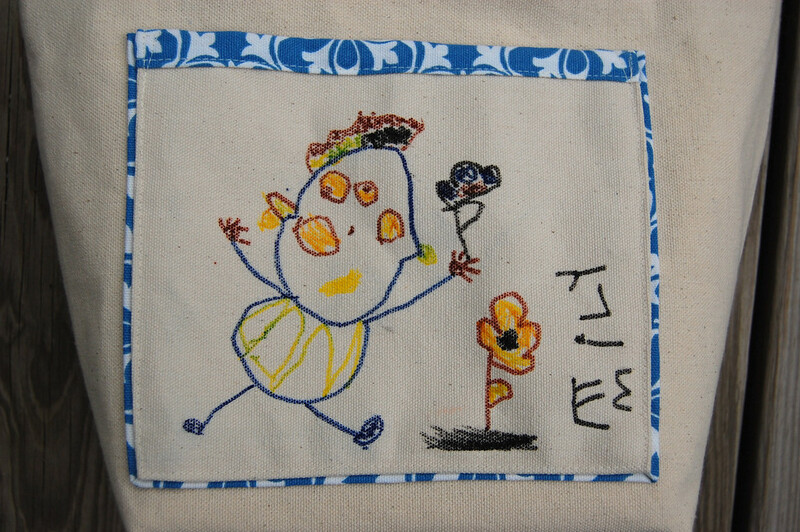 Lay something transparent/translucent over the motif and trace around it, leaving a border. This will be the size of the "window". I used a plastic bag that was lying around. 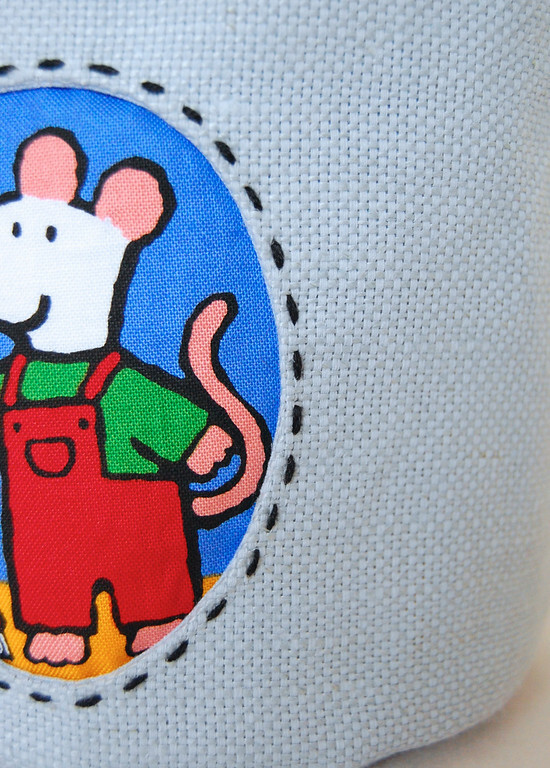 Cut around the outline you traced. This is your pattern for the window. 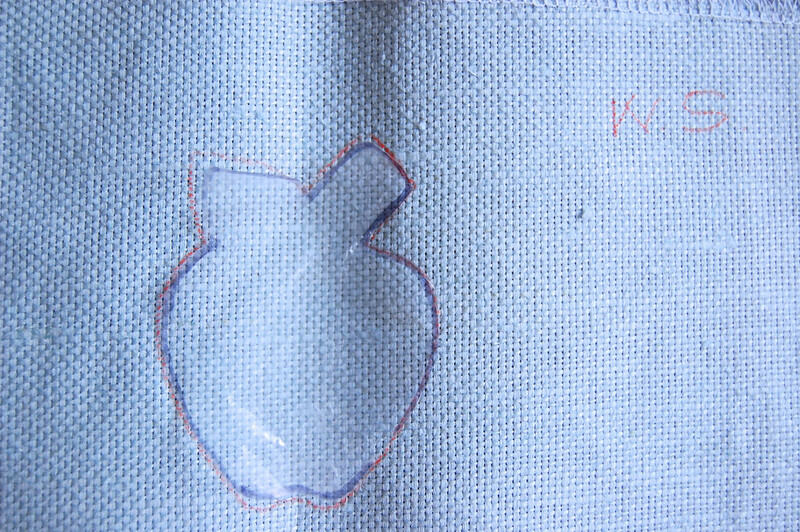 Flip it over so it is now in its mirror image, lay it in position on the wrong side of the outer fabric, and trace around it. 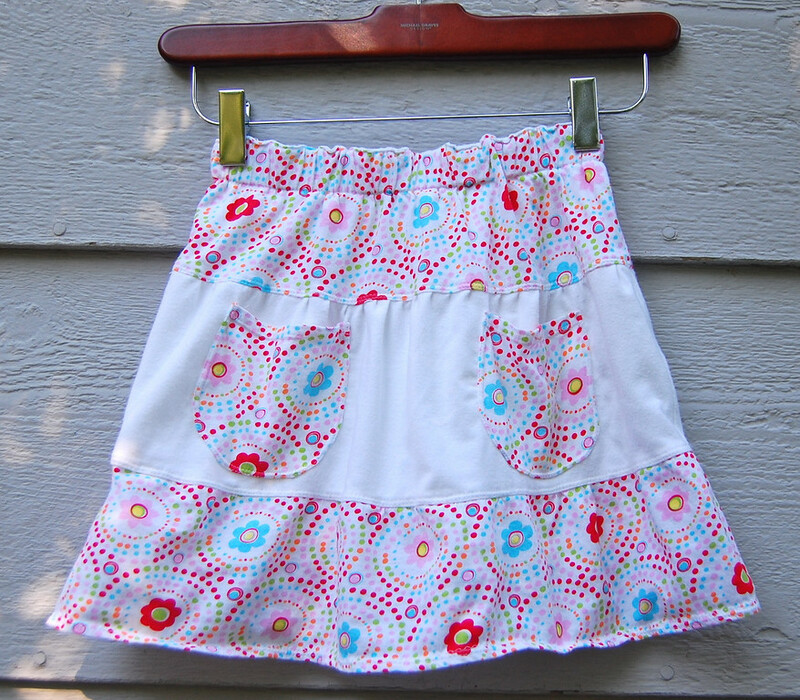 Find a piece of lightweight, coordinating fabric that is a little bigger than your window. This is your facing piece. 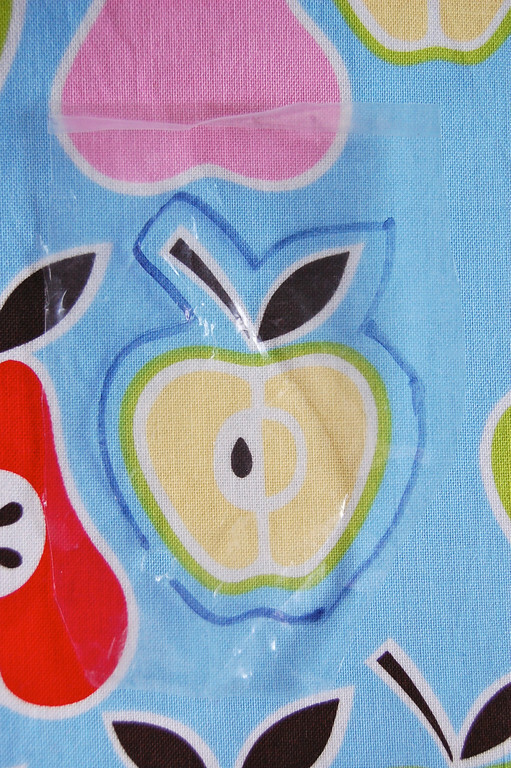 Lay the facing piece on the right side of the fabric, directly under your traced outline. 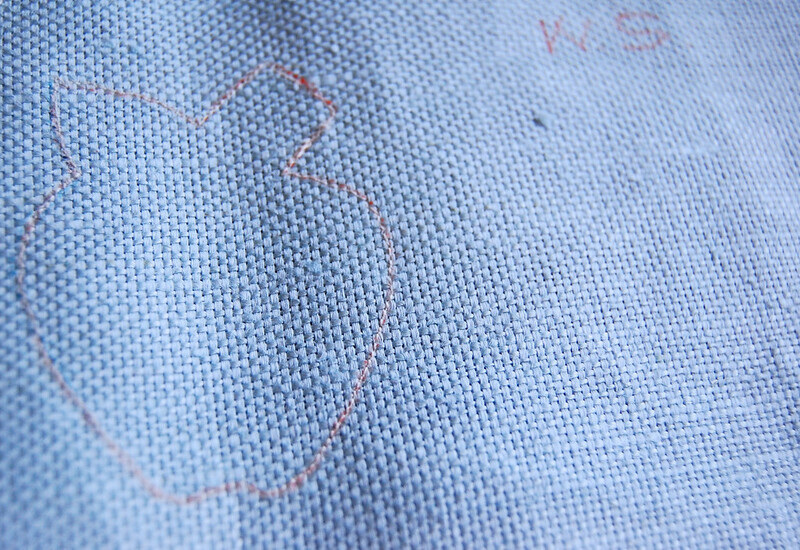 Using a short stitch length (better for corners and pointy bits) and sew directly over your traced outline, through both layers. 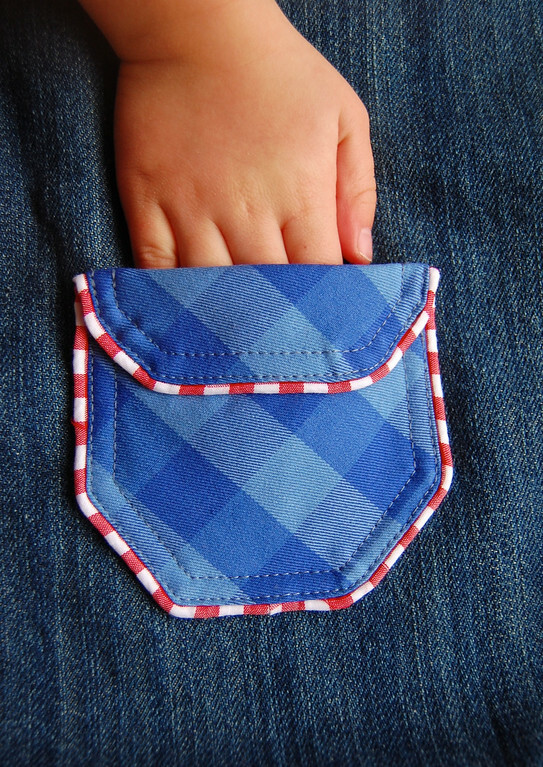 If you remember the free-floating inset pocket tutorial from last year, it's the same thing. Cut out the window, leaving a seam allowance. 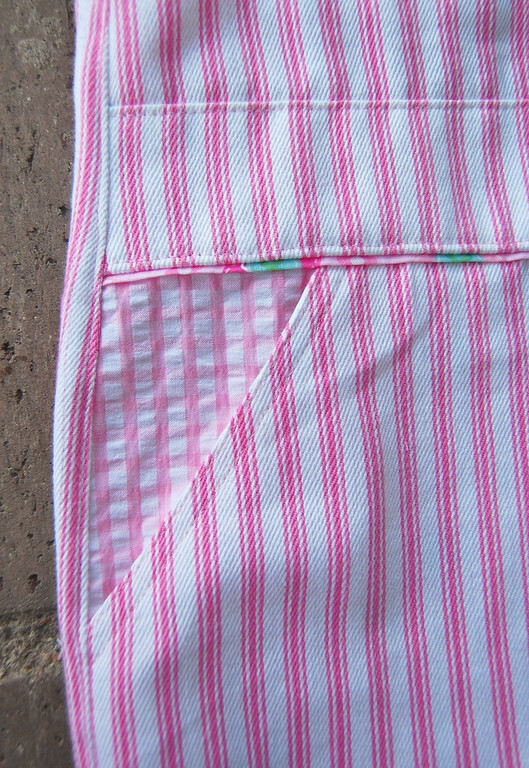 Snip this seam allowance carefully, paying attention to the corners and pointy bits. 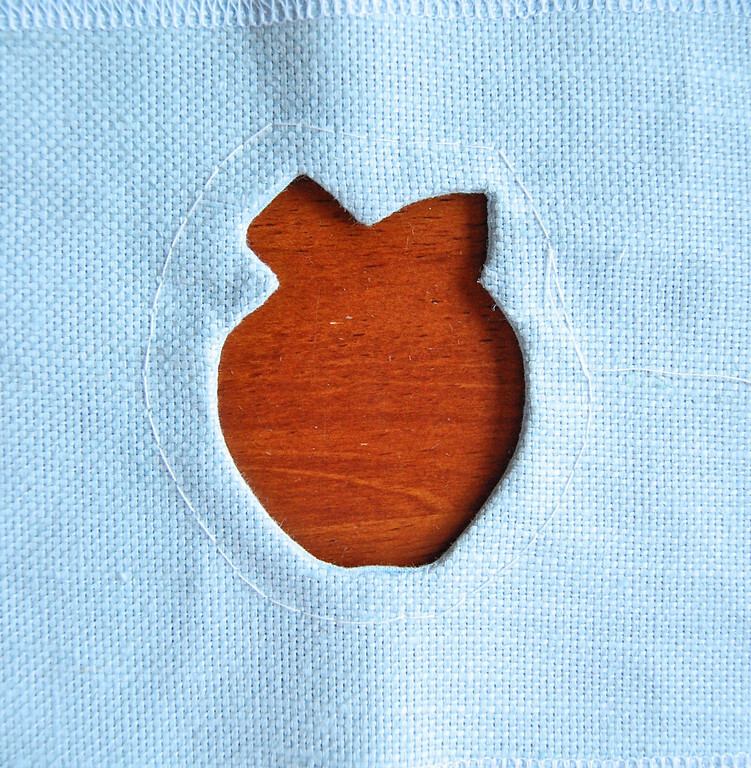 Turn the facing out to the wrong side of the fabric, through the window hole you cut out. 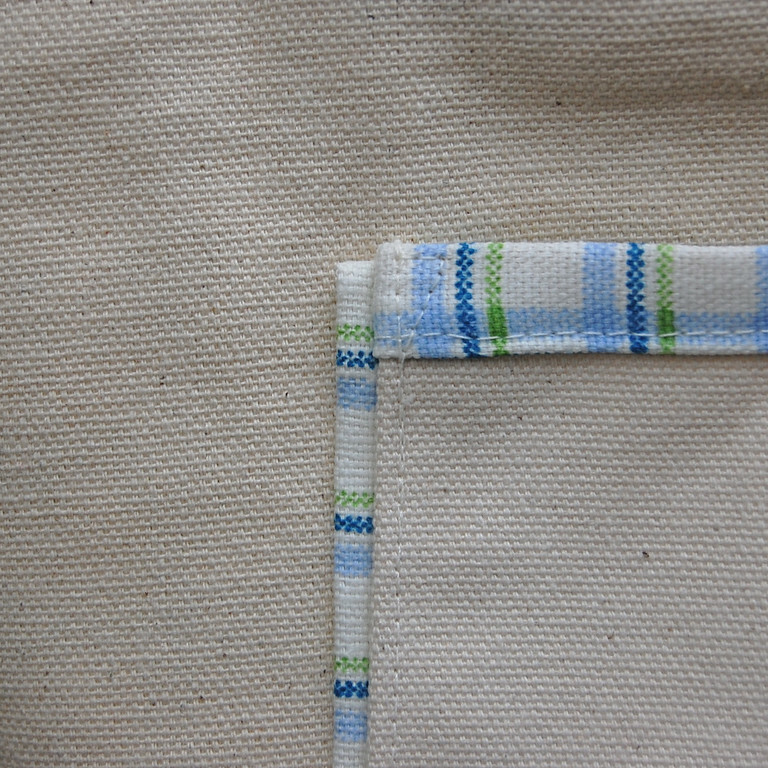 Press and baste (I used a long basting stitch on the sewing machine) around the window to hold the facing in place. 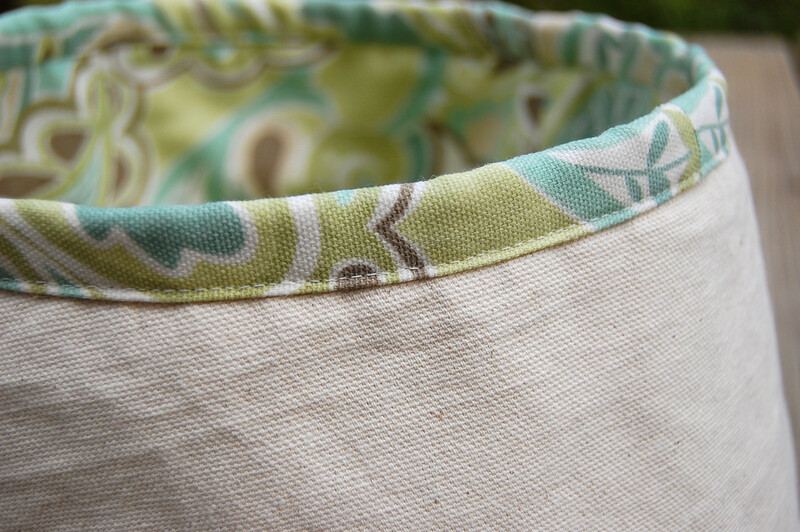 Try your best to keep the facing fabric from rolling forward and peeking out. 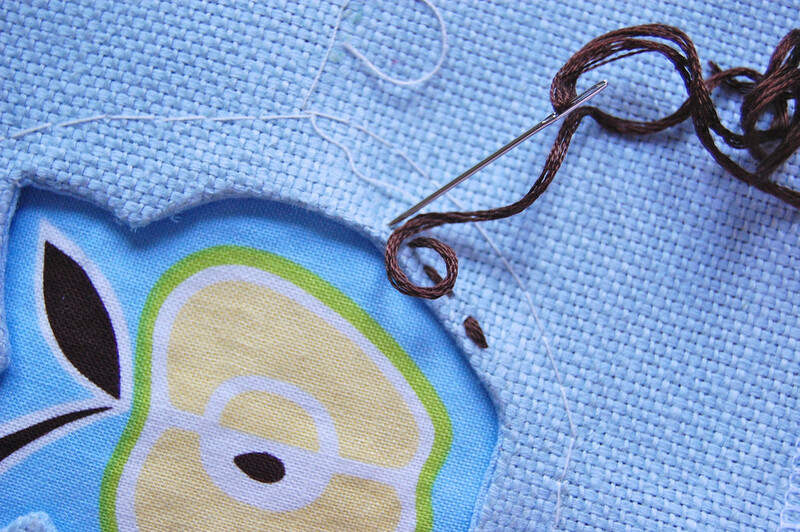 Do not baste too close to the actual opening, to leave room for your hand-sewn embroidery stitches. 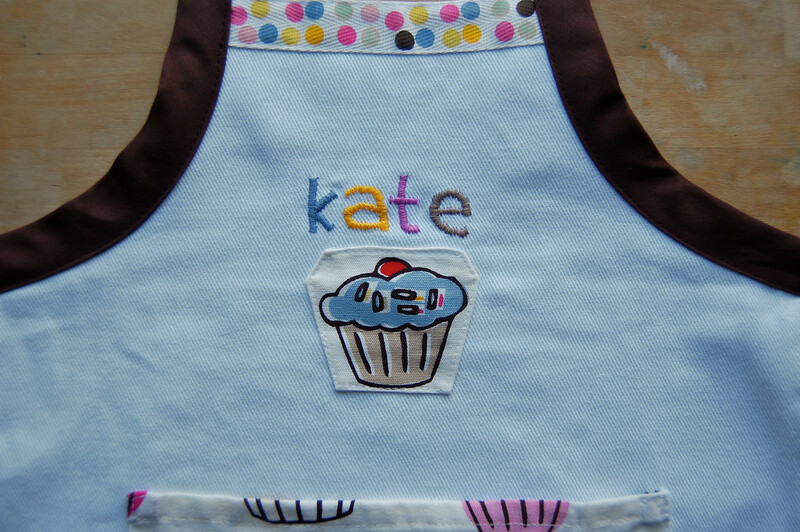 Cut out your motif, remembering to leave enough allowance all around it for sewing. If it is very thin (i.e. 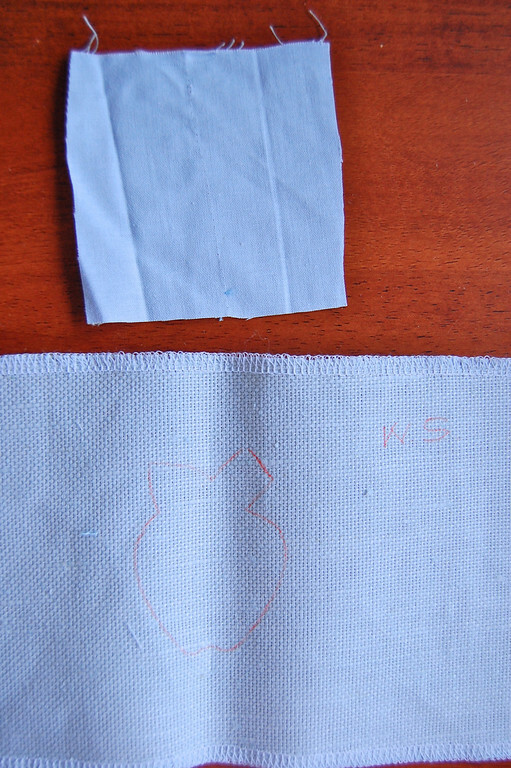 quilting cotton), reinforce it with interfacing on its wrong side. 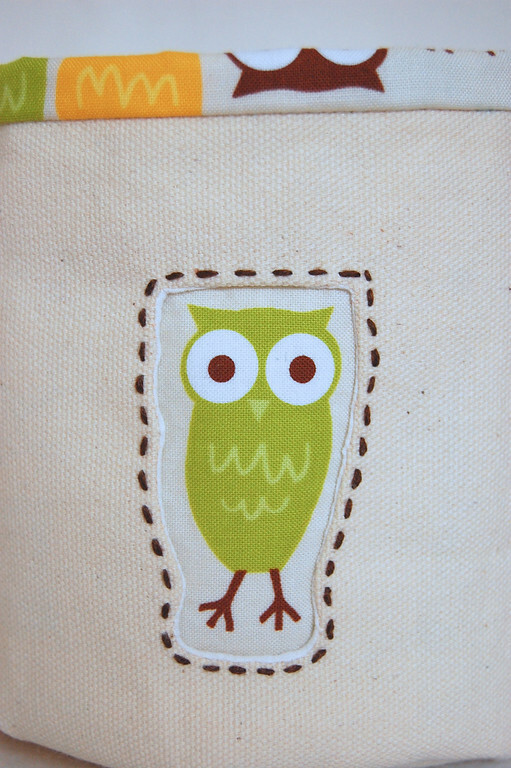 I used a fusible interfacing. Position it behind the window and either baste it in place or use some kind of heat-and-bond applique aid, if you need to. 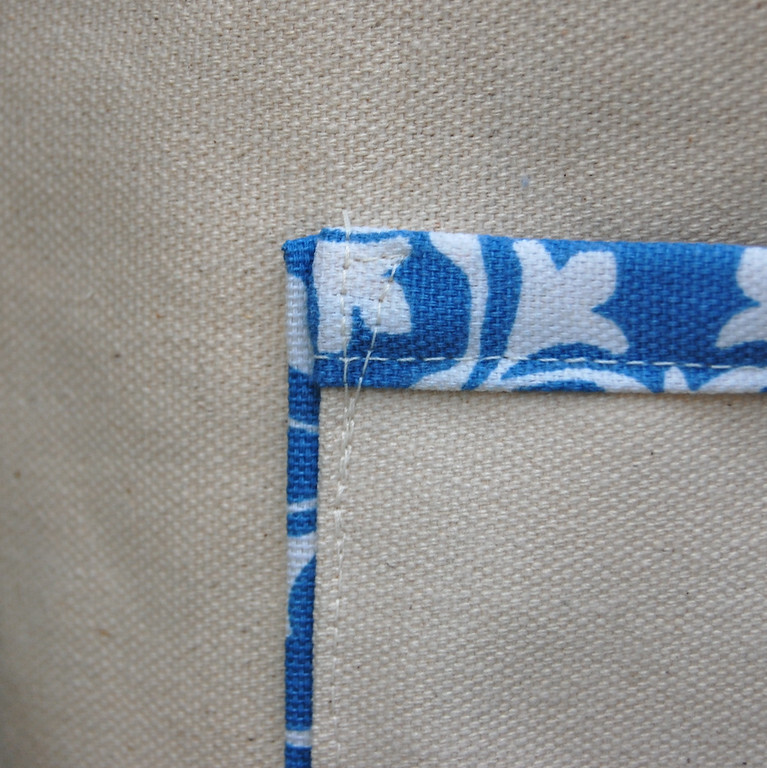 Stitch around the entire outline to attach the motif fabric to the outer fabric. 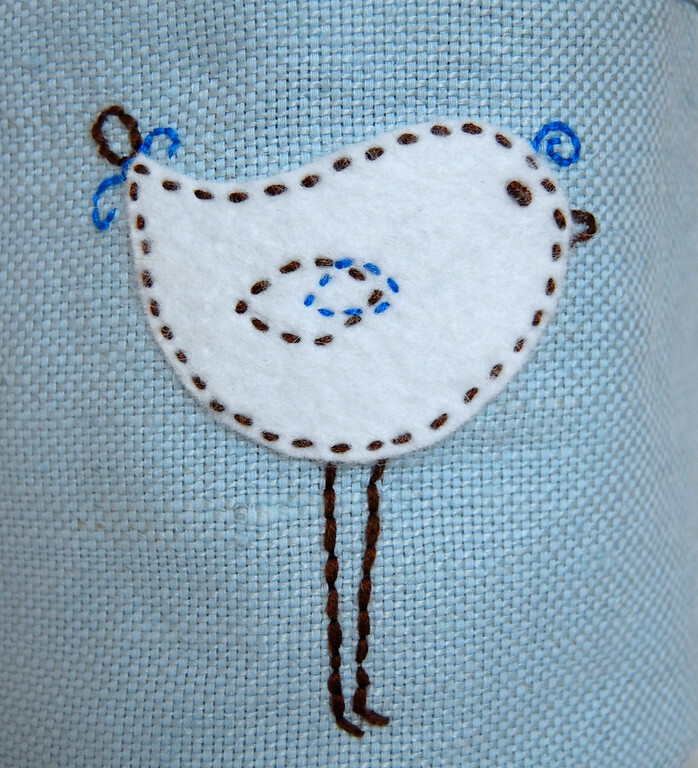 I used contrasting-colored embroidery floss and did a running stitch by hand. Depending on the look you want to achieve, you might use up to all six strands. 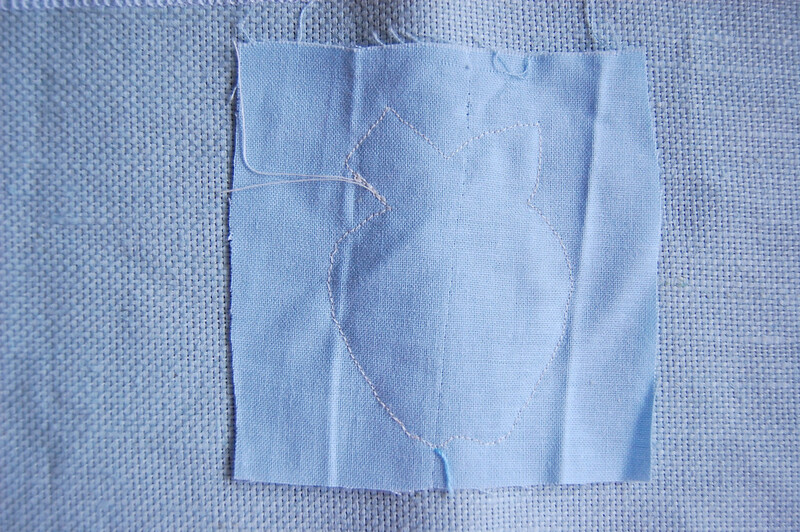 Remove the basting stitches. All done! And here is how it looks as part of the finished project. 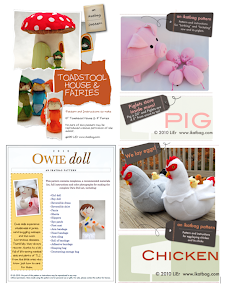 So there you are: 12 reasons to continue buying print fabric without actually having to go blind using it in a project. Less is more with print! I am in awe of your patience and attention to detail. I tend to want to just bang out a project and move on. The details escape me. You are inspiring! Maybe I will one day be able to slow down enough to enjoy making these beautiful finishing touches that make all the difference! 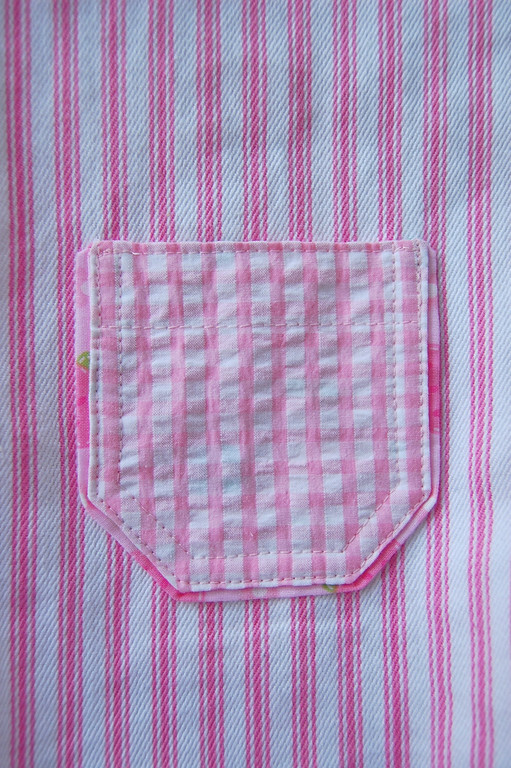 I so adore gingham that I think half my stash is gingham. I cannot resist it. 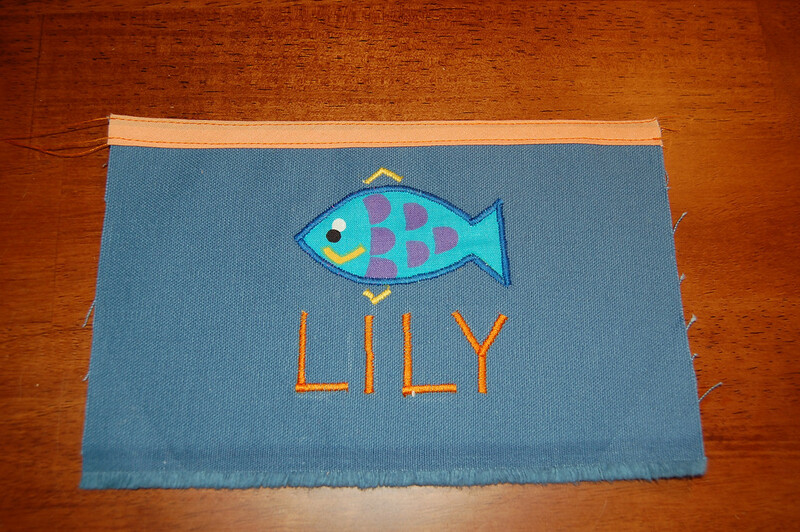 Question: do you use iron-on interfacing when you applique? I haven't always done that. . .just wondering. 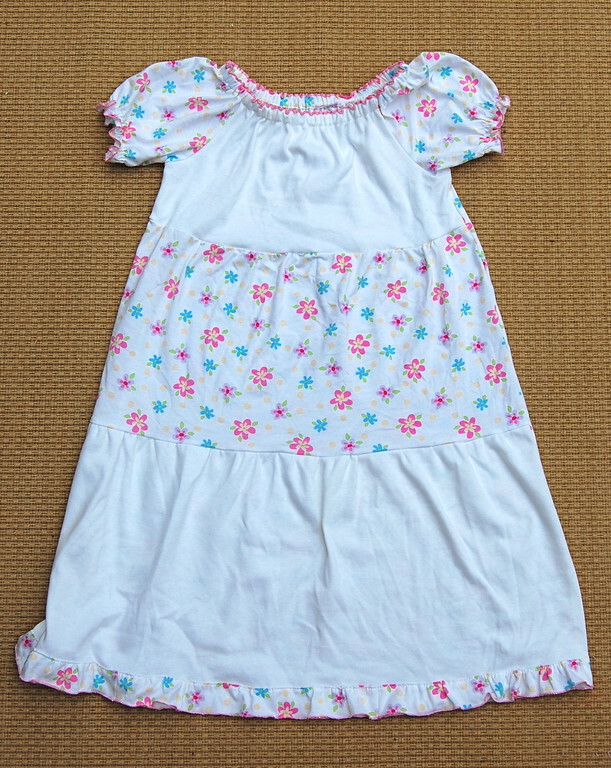 You make me want to sew little girl clothes for spring! This is good because spring is coming - truly. We got more snow this morning, though. . . FANTASTIC post!!! Thanks so much for the great ideas and inspiration for using patterns. 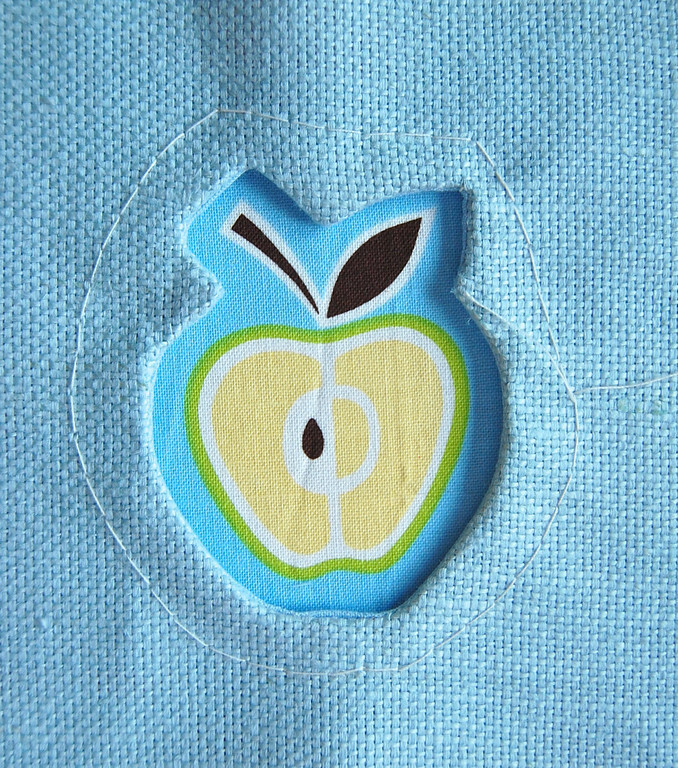 Also thanks for the tut on the reverse applique. I'm excited to try my hand at this technique. 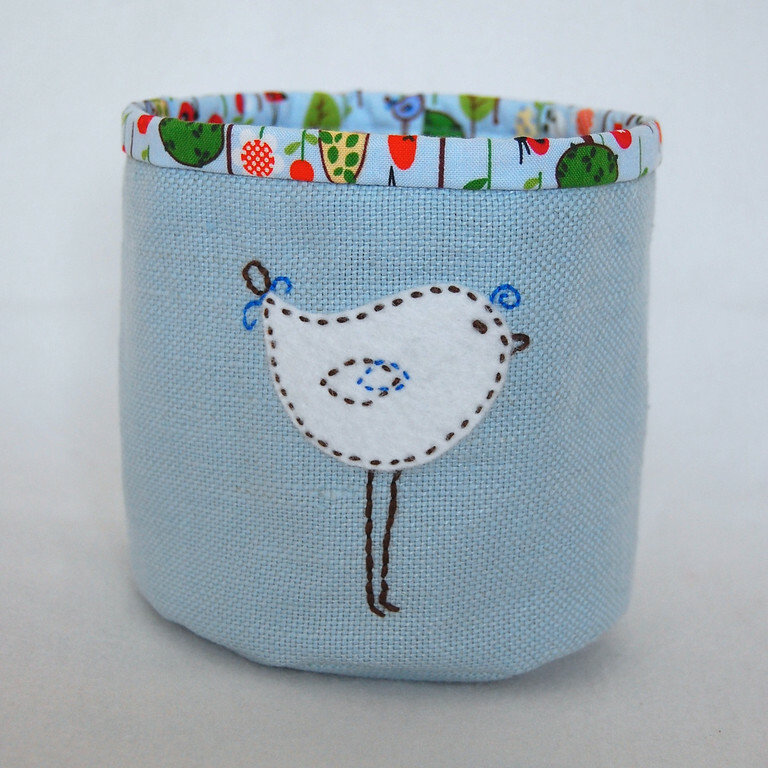 Your fabric boxes (rounds?) are great! 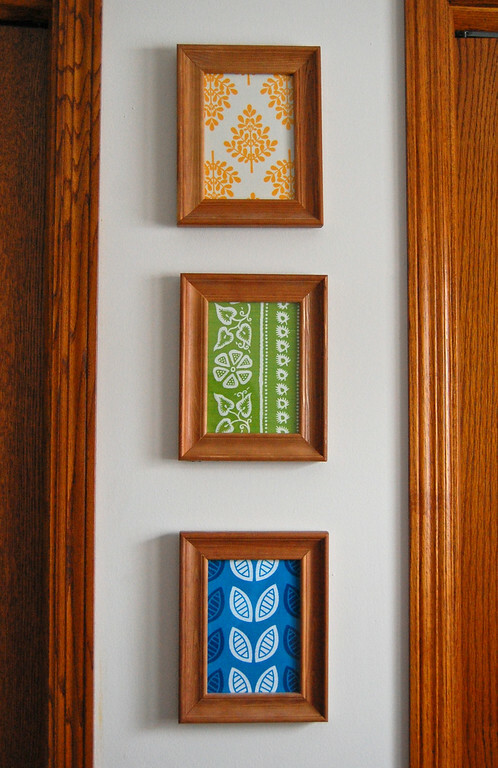 I'm thinking about making some to help my kids organize their room a bit more. 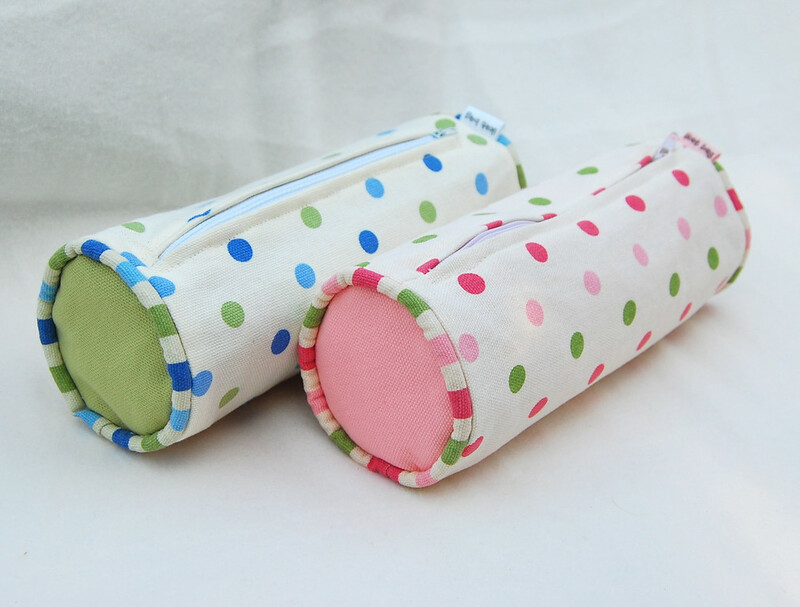 It would be fun to use patterned fabric as the liners that match the toys the would be stored - like cars for toy cars, camo for the army guys, etc. Thanks again for such a great post. I thoroughly enjoyed it! Fantastic post! I have an addiction to buying print fabric without really having any plans for it, so this post was super useful to me. 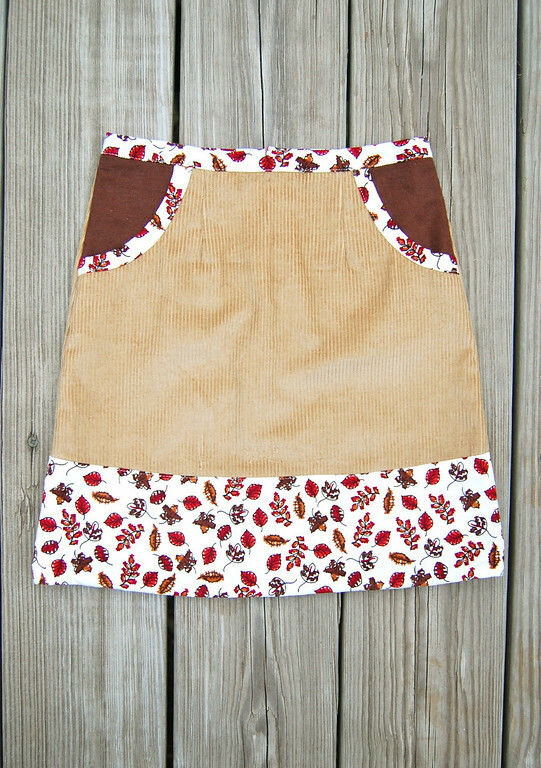 Thank you for the tut on reverse applique, it was great. I also love the bit on piping. Piping has always scared me but now I am inspired to try it. Thanks for another great post. 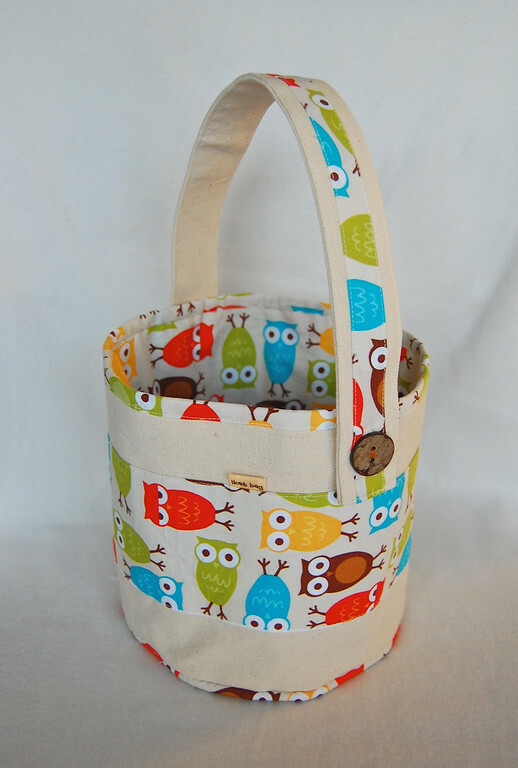 PS- I love the owl bucket. 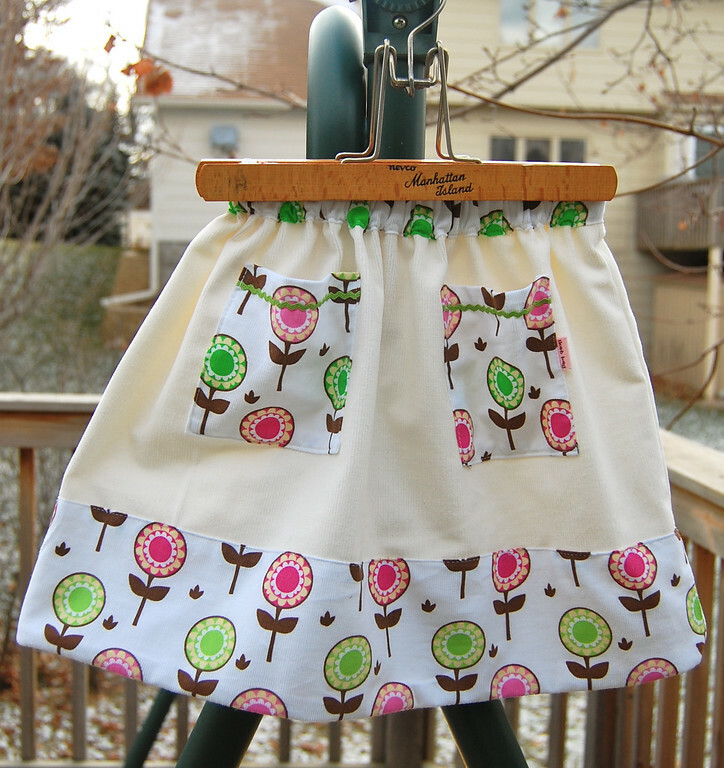 I may have to make some of these for Easter time for my girls. Great post!! Funny thing - to me, this post helped me because I really prefer print fabrics, but I do feel solids are more wearable because they go with more. 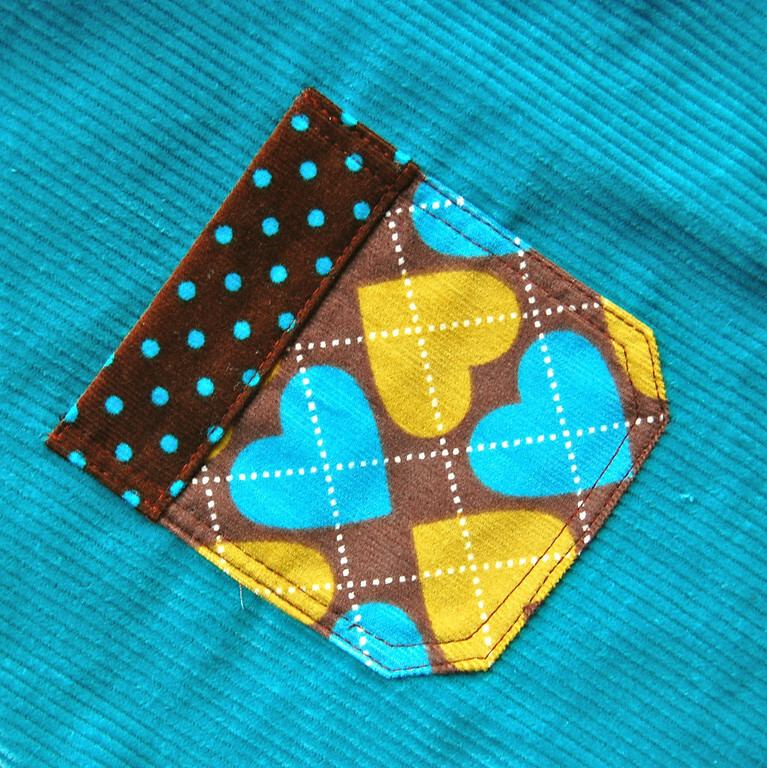 So, this showed me lots of ways to combine the solids with prints so they don't feel boring to me! Great post! Thanks for the fantastic tutorial! NO! Fabric diet until I get some projects finished!! Thank you ! Your ideas are great. That would be a very nice topic for a class, I think. First of all, I enjoyed your post as always. I feel like I can learn few things every time I am here. It's awesome! 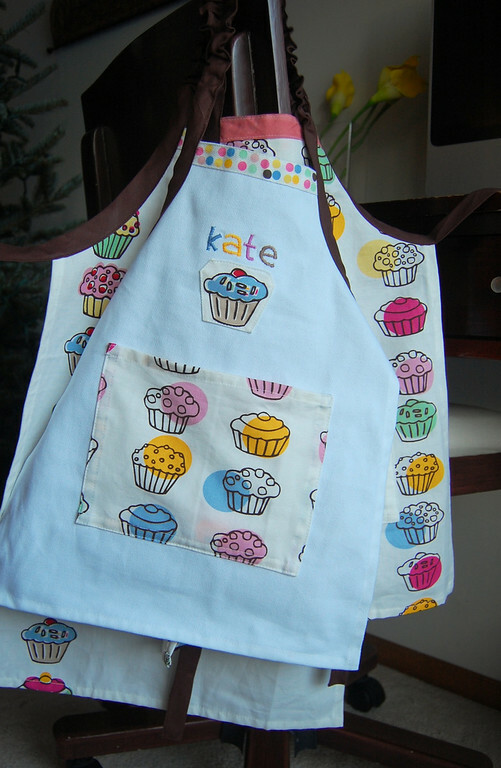 Secondly, what a great list of ways to use print fabric?! I've stash of print fabrics and don't even know where to begin with! So Thank you so much for posting this! P.S. I am a solid girl and your loyal fan! Favorite post yet. I went through a period of compulsive pattern purchasing... but sadly can't seem to every find a use for them. Now I am brimming with ideas to use them. Thanks! Great post! And thank you so much for the tutorial. "Less is more with print" - those European designers could learn from this wise adage :) Sometimes when I see some of the European stuff, I feel like I need to make more stuff like them for my kids. But I resist because I know that in a few months (okay, more like weeks :) I'll get sick of my bad taste in subjecting the girls to print overload. 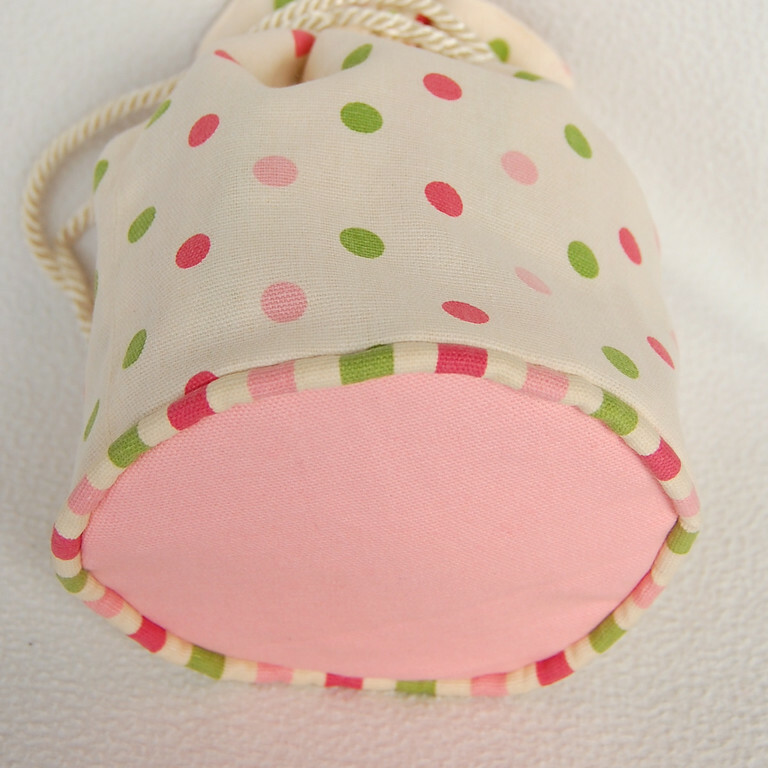 Besides, as much as I love print, I love dots, stripes and gingham more! Hello Tone! No, I am originally from Singapore. My husband's family was from Norway, though. So we love lefse, krumkake and even had the krensekake at our wedding! Thank you so much for this post! So much inspiration!! Yikes, I have the same solid/print thing in my fabric selection! I LOVE the cutout tutorial! You make it so simple! I may just go make something right now! Thanks for using up all my spare time! 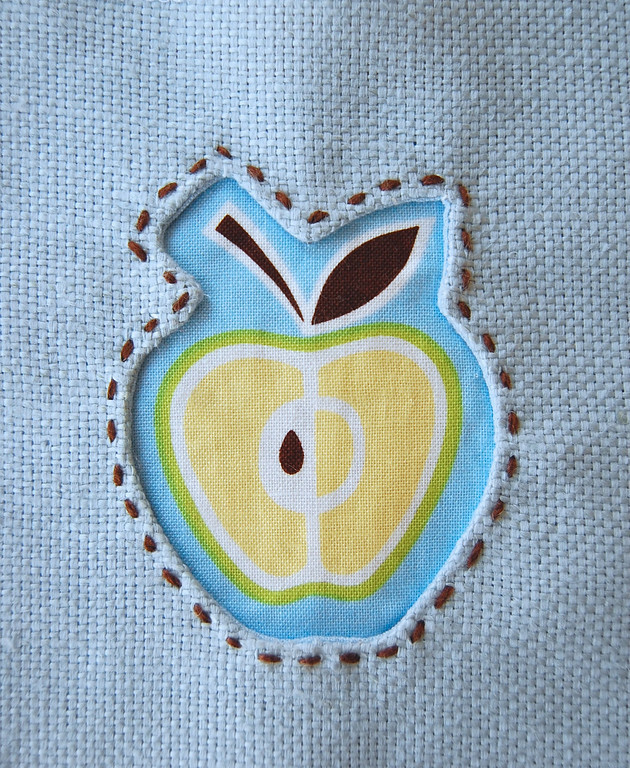 I love the reverse applique - thanks for showing me how to do it. Sei fantastica!!!!!!!!!!!!!!!!!! Molto bello e interessante! You are amazingly talented. Thanks for sharing your great ideas and how to implement them in such creative ways. I LOVE all of your ideas! I am sighing because all I can do is copy instead of create!!!!! Thanks so much. 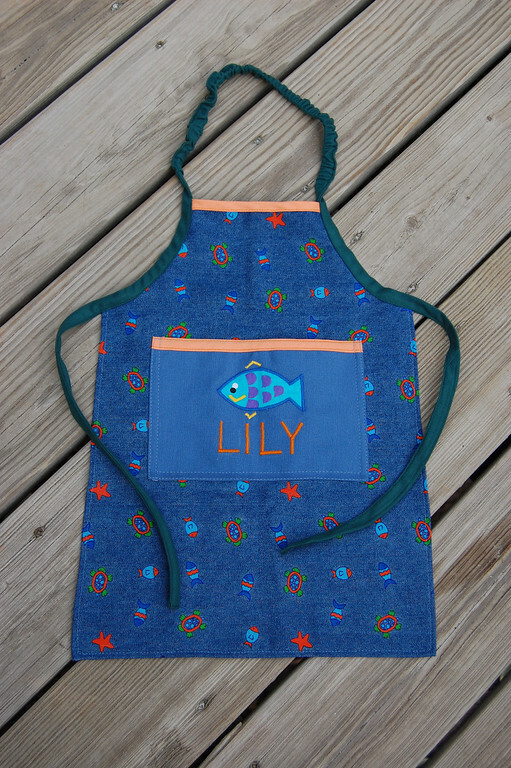 I am going to have to try the cording and the reverse applique. THese are my favorites!